Gunung Kinabalu (Mount Kinabalu) is big. Standing at 4095 meters (13,435 feet) it is easily the highest mountain in Malaysia (see the list of Malaysia's highest 300 mountains). Mt. 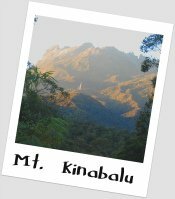 Kinabalu is often wrongly quoted as the tallest in south-east Asia but actually it is only the 10th highest, beaten by 6 little known peaks in the Kachin province of Burma and a further 3 peaks in West Papua, Indonesia. 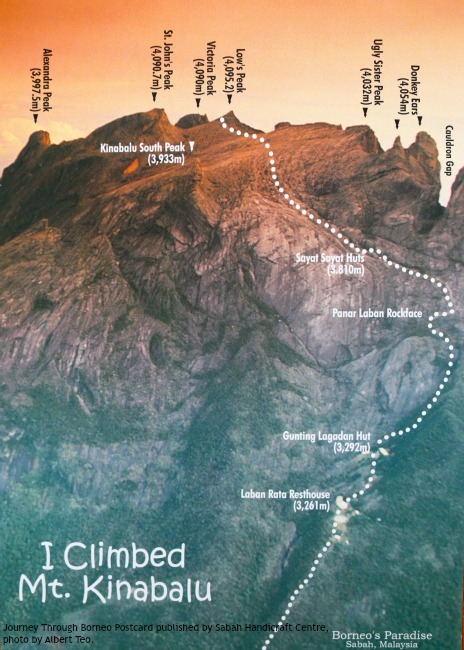 Climbing experts rate Gunung Kinabalu as one of the easiest big mountains you are likely to climb but don't go thinking it is a piece of cake - they are comparing it to the likes of Everest or Matterhorn. Climbing Mt. Kinabalu was really hard for me. Usually the trail starts at Timpohon Gate (there is another route, the Mesilau route which is longer, harder and less popular). The starting point is already at 1866m above sea level and since the route is pretty much straight uphill all the way the actual height climbed is (only!) 2229m. The distance travelled is around 8.7km each way. There is no need for any specialist mountaineering equipment - all that is required to reach the summit of Gunung Kinabalu is a reasonable level of fitness and a dogged, determined mental attitude. Gunung Kinabalu is situated in Kinabalu National Park, 88 km (2-3 hours drive) from Kota Kinabalu, the state capital of Sabah, Malaysia on the island of Borneo. 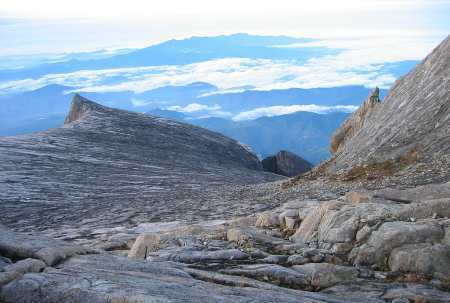 Kinabalu National Park covers an area of 754 sq. km. and contains thousands of species of plants, orchids, butterflies and birds. The park is very well managed and, as a UNESCO World heritage site, it is a credit to Malaysia. Kinabalu Park is well geared up to handle the large numbers of climbers who ascend Gunung Kinabalu every day. Most people spread the climb over two days. After completing all the necessary registrations and payments at the Park HQ, and picking up the guide, people take a mini bus to Timpohon Gate, the usual starting point. The path is well defined and maintained and consists mainly of rough, uneven steps. Climbers pass through rainforest at the beginning which thins out to more temperate vegetation at higher altitudes. There are about 7 shelters along the way where you can catch your breath, use the toilet, refill your water bottles and deposit any rubbish into bins. 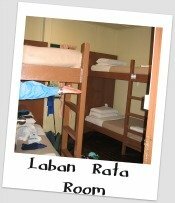 The climbing time on day 1 for most people is between 4 - 7 hours before arriving at Laban Rata, 3272m, where there is a large hostel (and some smaller huts) with hot showers, toilets, cooked food and basic sharing rooms with bunk beds. My climbing buddy and I were put into a room with two other guys. We made the mistake of booking a heated room - it was stiflingly hot! We arrived there about lunch time. There was quite a rush for the food at meal times but plenty to go around. With little else to do in the hostel and no energy left to wander around, everybody retired to bed early to prepare for the next day's early trek to the summit. We rose at 2am for a 3am start. We started up endless flights of steps with some ladders and ropes in place to assist over the tricky bits. At the beginning we had to almost queue up at the congested areas which was a bit annoying but soon enough the crowd thinned out as people moved at different speeds. We became a long procession of spread out headlamps twinkling in the dark. Above Laban Rata the vegetation disappears. The final stages of the climb are over a massive bare granite slab, smoothed and furrowed by some long-extinct glacier. At this level, altitude sickness began to take its toll on some who experienced nausea and leaden limbs. Plodding on became a mental struggle. I just kept looking at the feet of our guide (who of course was feeling no ill effects despite wearing cheap plastic shoes) and I tried to follow in his footsteps and keep up with his pace. This kept me going. On reaching the summit (Low's Peak) it was beginning to get light. The peak was packed with people taking turns for their photo opportunity next to the plaque marking the highest point. We hung around for half an hour or so to await sunrise. I was freezing due to my inadequate clothing and lack of gloves so it was good to start the descent. Coming down, though easier on the heart and lungs, was brutal on the knees and much harder than going up for me. The first couple of hours back to Laban Rata, where we had a well earned breakfast, were OK but the next 3 hours or so down to Timpohon Gate were gruelling. The steepness of the path, the endless rough steps and unforgiving terrain inflicted a constant punishment on my tired old knees and by the time we reached the bottom I was in some pain. I could hardly walk for the next few days. (I was not the only one - Kota Kinabalu residents must be used to the sight of foreigners hobbling around town. Still, I collected a very attractive certificate from the Park HQ to mark the achievement. To climb Gunung Kinabalu you must pay for Park Entry, Climbing Permits, Climbing Insurance and a guide. A guide is compulsory. You also need to pay for the bus from the Park HQ to Timpohon Gate starting point and back again. All the charges are reasonable and details of the latest rates can be found on the Sabah Tourism Board Official Website. 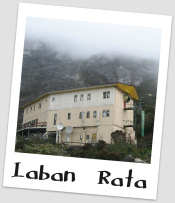 You must book your accommodation at Laban Rata well in advance as supply is very limited. Reckon on spending at least USD100 per night per person. Not cheap for hostel accommodation but it does include all meals and bear in mind that everything the hostel consumes, from food to clean sheets, has to be carted up the mountain on a porter's back. The night before the climb we stayed at Hill Lodge, one of the various accommodation choices available at Kinabalu Park, a short walk uphill from the Park HQ. Staying here you get a good early morning view of Gunung Kinabalu and it enables you to start and complete your climb to Laban Rata before the clouds (and perhaps rain) roll in. 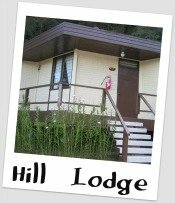 Hill Lodge has individual chalets with private bathroom and 2 single beds. For availability and room rates at Hill Lodge and other hotels at Kinabalu National Park take a look at Agoda's website and obtain discounted rates. For the climb, a couple of T-shirts, a fleece, windproof/waterproof jacket and trousers, worn-in walking boots, hiking socks, trekking pole(s), headlamp and spare batteries, hat or tuque, gloves (don't forget like I did! ), water, snacks, altitude sickness tablets, sun block, insect repellent (very few bugs on my trip and no leeches), deep heat/tiger balm, lip balm, plasters, camera, tissue paper. Climbing Gunung Kinabalu Not Challenging Enough? If climbing Gunung Kinabalu over two days is too easy for you try running up and down instead. Every year they stage what is billed as the world's toughest mountain race, Mt. Kinabalu International Climbathon, in which a field of super-fit nutcases run to the top and back for the ultimate fitness challenge. Last year's winning time was just over 2 hours! Or, for a different sort of challenge, try the Via Ferrata located not far from the summit of Mt. Kinabalu. A Via Ferrata is a kind of mountain climbing assault course with steel ropes, harnesses, ladders and so. The one on Mt. Kinabalu is the world's highest. It is operated by Mountain Torq. Maybe you would like to try climbing some more of south-east Asia's challenging peaks? Find out how climbing Mt. Kinabalu compares with Vietnam's Mt. Fanxipan and Indonesia's Mt.Rinjani by reading this article on my blog.